Can the tile and countertops be found at Lowe's? They're gorgeous. Thanks for your interest! This is a lovely installation of our 2x4 field in Sage crackle. We do not sell to Lowes, but our tile is available in showrooms throughout the US. Beautiful project Michael Knowles! Where can I find this tile? Please, I can't seem to find it!! - I love the color! Design & Build . . . by Roger Perron, Inc. Kitchen sink - What kind of kitchen sink is this? I need a brand or name to be able to tell my builder. Thanks! I'll definitely check them out. Could you please tell me where the pendant lights are from? Thanks. The designer never responded but I bought Quoizel lights that I really like and are close to the picture. Quoizel QZ-GRT-1508-IS is the Grant transitional mini pendant light I used over the kitchen sink and quoizel QZ-GRT-2814-IS is the Grant transitional pendant light which is over the kitchen table. I bought them through houzz and they were delivered pretty quickly but I'm sure they're available elsewhere. Please let me know if you have any other questions! What are the counters and color? Simply beautiful! Thanks. The counters are Absolute Black granite, honed finish. 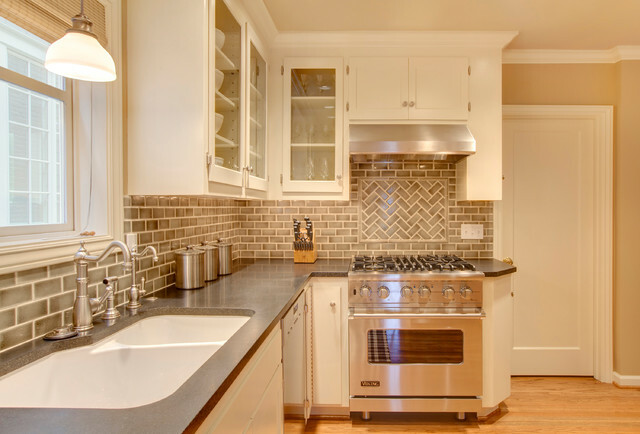 Would you please tell me the style and brand of the range hood? Beautiful! what color grout did you use? really beautiful! Do you have the colour that the cabinets are painted? - This kitchen is beautiful! Great design! What colour are the cabinets? What is the size of the cabinet to the right of the stove? Thanks. It's about 12" wide x 24" deep with a chamfered corner. Model Name/Number of the Viking stove (w/no backsplash)? Thanks. We matched the existing wall color. Backsplash still manufactured? - Hi - in a previous comment this was listed as sage crackle; but I can't find this color on the encore Ceramics website any longer. Did they replace this color with something similar? I love it! Subway tile - Who is the manufacturer? Wall color - What is the name and Brando of the wall color? Faucet - Can you tell me the name and model of the faucet? AFTER: After searching through dozens of kitchen photos on Houzz featuring black granite, the Freemans determined the look they wanted very quickly. “The ideabooks allowed us to communicate with Michael and Colleen much faster,” says Jessica Freeman. “It was an absolute dream to work with them.” Michael closed off the kitchen ceiling and repainted the cabinets in a bright white. The cabinets had to be removed during construction, but he put them back in using almost the same layout. A new granite countertop and gray tile backsplash add contrast to the color palette, while new pot lights and ceiling pendants make the kitchen feel brighter than it did with the higher ceiling. I like the tile above the range being different. I do like the Chevron pattern but that would depend on what type of backsplash we go with.